Digital healthcare marketing is changing. 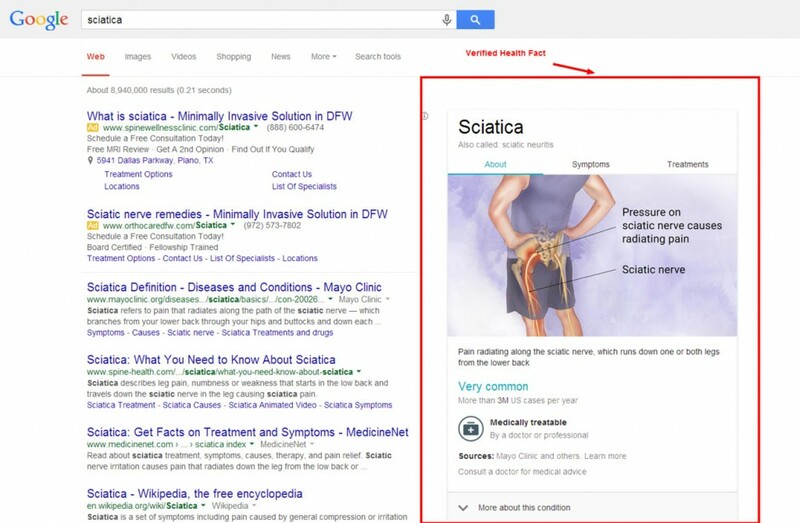 If you haven’t noticed yet, Google has been adding “Verified Health Facts” to search results. Tuesday, Google announced that this week they would start to roll out 400 new doctor verified facts that include symptoms, treatment options, diagnosing, and prognosis. Many of the most common conditions are already returning results that include verified facts. Not sure how to use it? Google has provided a tutorial page that also includes a feedback section to report errors, for those of you that are questioning the accuracy of the facts. So, what does this mean for your digital marketing strategy? Well, there are several things. I did a search for sciatica and was shown this search result page. While the new result doesn’t push the number 1 search result down, it takes up the amount of space as the first 6 listings, and rests almost entirely above the fold. A few ways to combat this change in real estate distribution, you need to increase your share of voice. While not entirely easy for such broad search terms, it can be done. Wait, where are my Adwords Ads? 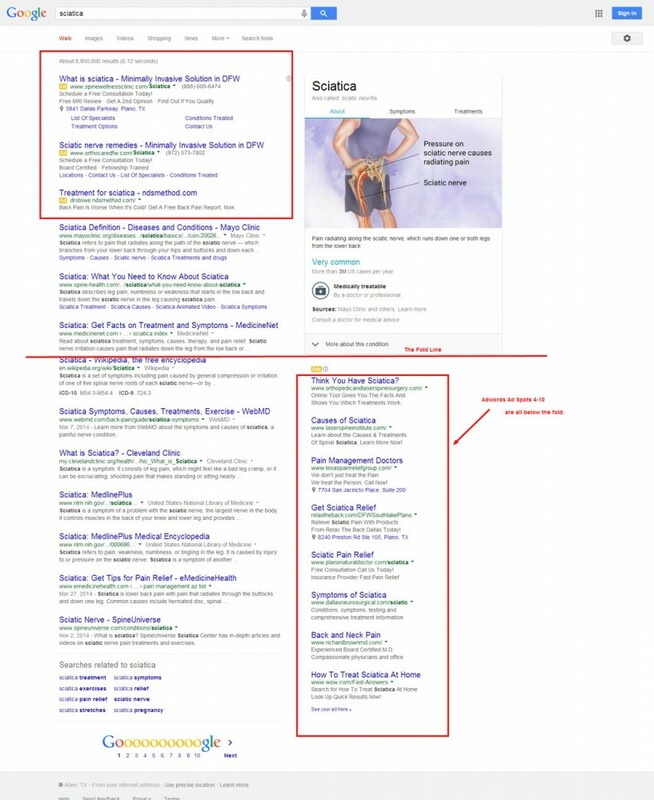 The SERPs still include paid search ads at the top and sides of the page, it has affected the placement and visibility of those ads. The big thing to take note of here is that paid ad spots 4-10 are pushed below the fold with this particular search. Depending on whether the Verified Health Fact has an associated photo and what size that photo is will determine whether the sidebar ads are above or below the fold. This will certainly affect Adwords bid prices. Most likely we will start seeing an increase as companies fight for the top 3 spots that are still visible above the fold. At the same time, ads below the fold will become less visible with a lower click through rate. What will be interesting to watch is how much these new Verified Health Facts affect click through for PPC ads overall. If this happens, not only would a company be paying higher bid prices but would also generate a lower click through rate even for the top spots because of the massive visual interest that is produced when an illustration is added into the Verified Health Facts. That doesn’t necessarily mean that the higher price won’t be worth the cost; since the Google Verified Health Facts area will provide basic details for users at the beginning of their search, the percent of clicks by users just looking for basic information will decline. One could reasonably project that the conversion rate for ads could go up, despite a lower CTR. One third of people already do Google Searches for answers about their ailments. The addition of Google Facts will likely increase the search volume for health related searches because more users will become aware of ease reliable medical information can be located. 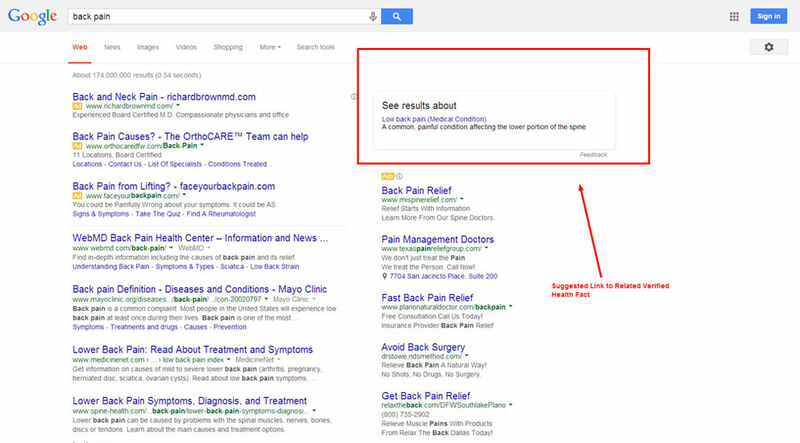 Regardless of whether it is searchers intent to only read the Google provided health fact, we know that some will still click on other results. Not all search result pages have a verified fact showing up yet. As you can see, some only include a link to a new related search that does include a health fact. Still others include a Google generated fact, but no illustration yet. While this does affect how many ads are shown above the fold, several still are visible. Continuing to write and optimize for conditions, symptoms, and their treatments is more important than ever. 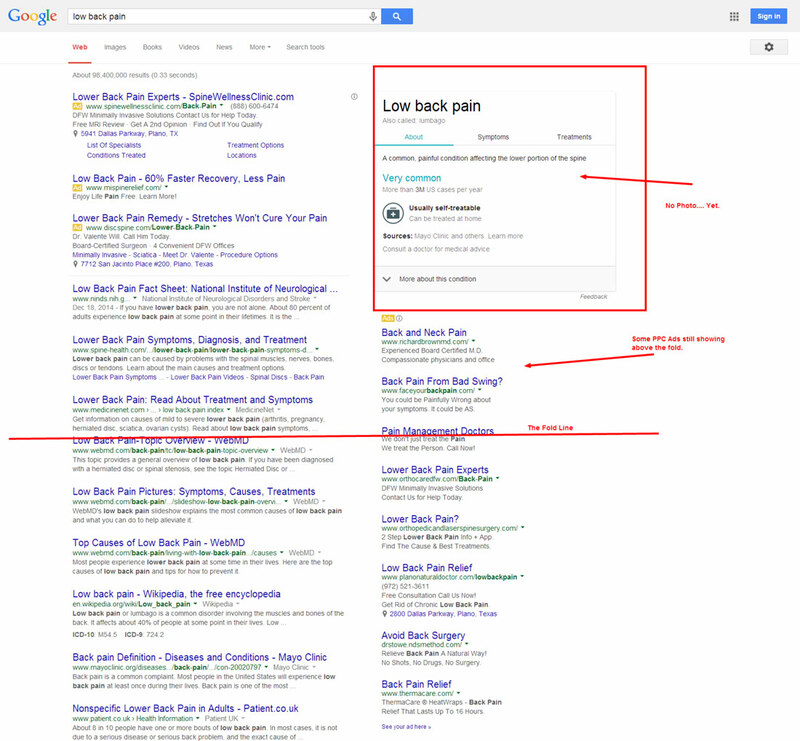 Notice Google verified medical facts aren’t even referenced in some of these mid/long tail searches. Although some of these searches may eventually have an associated link noted or potentially host a verified fact, it is still worth noting. Keeping semantic search optimization in mind will help you to achieve an adaptive strategy that will play well with the new Good health facts. Also, focusing on more in depth articles will likely be a key factor in many marketing strategies in healthcare. With more details about each illness being easier to find, we will likely seem more knowledgeable searches being conducted by users. While this will absolutely affect your marketing strategy, it may not necessarily be a negative impact. It will be interesting to watch more of these illness facts be released particularly to see how companies respond in their search marketing adaptation. Request Your Complementary Phone Consultation Now! Are Your Competitors Leaving You Behind?